Our latest quarterly report on recent catastrophe bond and insurance-linked securities (ILS) issuance has now been published. The report, ‘Q1 2016 Catastrophe Bond & ILS Market Report – Another record first-quarter‘, analyses a record Q1 with $2.215 billion of issuance. This report reviews the catastrophe bond and insurance or reinsurance-linked securities (ILS) market issuance at the end of Q1 2016, looking at a record level of new risk capital issued during the first-quarter and the composition of transactions completed. For the first time in its history the catastrophe bond and ILS market has ended a quarter with more than $26 billion of outstanding market capacity, driven by a record-breaking start to the year that saw $2.215 billion of new risk capital issued from ten transactions, lifting the outstanding market to $26.516 billion at the end of March 2016. This the third consecutive year with record first-quarter issuance, helping the market to continue its growth trend and demonstrating the increasing reliance that sponsors place on capital market-backed reinsurance protection. It was also the second consecutive first-quarter featuring over $2 billion of issuance. The first-quarter is often a busy period for the sector as renewal deals come to market, and although an impressive $800 million of deals were issued during January, the second strongest January issuance volume ever recorded by Artemis, more than $1.4 billion of new deals in February and March helped the market achieve outright growth once again. Despite a substantial lack of privately placed deal issuance (or disclosure) in Q1 2016, particularly when compared to a year earlier when almost half of new deals issued were considered private, sponsor and investor appetite clearly remained strong during the quarter keeping the market on its impressive growth path. The first quarter of 2016 saw a diverse range of perils come to market from ten deals, consisting of 15 tranches of notes. This diversity was welcomed by investors, as they sought to deploy capital into perils that will ultimately assist them to grow their portfolio assets at future renewal periods. For full details and a breakdown of key issuance statistics, download the report. Investor appetite remains high and sponsors are increasingly comfortable with placing a cat bond, or other ILS product, within their reinsurance programs. There are reports and evidence that ILS fund managers are accepting new inflows in 2016, as they expect continued deal-flow in the form of catastrophe bonds as well as growing opportunities to deploy capital into collateralised reinsurance. As we move through 2016, with the key mid-year reinsurance renewals fast approaching, investors will be hoping to see both continued growth of the outstanding catastrophe bond market, as well as growth in terms of alternative capital deployed into ILS structures. After such a strong start, 2016 looks set to be another impressive year for the ILS market. Also in this Q1 2016 report we feature market commentary from co-editor GC Securities, the investment banking, capital markets and ILS specialist arm of reinsurance broker Guy Carpenter. 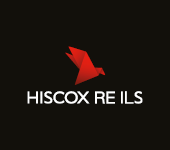 Download the report for commentary on property catastrophe reinsurance pricing and dedicated reinsurance sector capital. 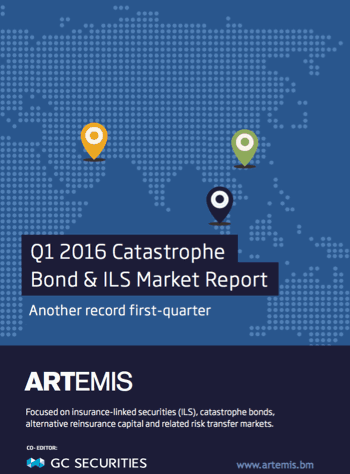 For full details of the quarter, including a breakdown of the issuance by factors such as perils, triggers, expected loss, pricing, and analysis of the issuance trends by month and year, download your copy of Artemis’ Q1 2016 Cat Bond & ILS Market Report here. Don’t forget that you can view the breakdown of the outstanding catastrophe bond and ILS market, as well as other statistics on the market and its growth, using our ILS Market Dashboard and range of ILS market charts, statistics and graphs.